The Meyers Pro 12 and Pro 14 Semi-V aluminum boats are designed for trailering and have a deep, flared bow to prevent water from spraying the user. 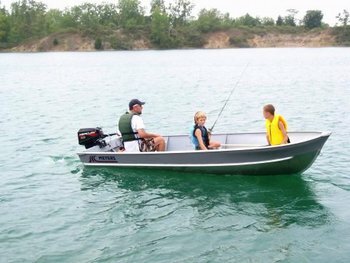 Meyers Boat Company is a boat manufacturer in Adrian, Michigan USA. The company has been under its current ownership since 1991 when it was moved from Tecumseh, Michigan. Today, the company produces Meyers semi-v and jon boats, Michicraft canoes, Sportspal canoes, and Snark sailboats. Meyers Boat Company also owns the subsidiary companies of Seacycle, Waterbike, and Walden Kayaks. Meyers Boat Company is proud to offer affordable, American made marine products that will stand the test of time.